Viral infections induce the expression of type I interferons (IFN-alpha and IFN-beta) genes. The induction is due to the transcriptional activation of the IFN genes. 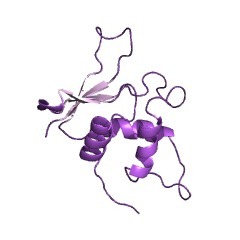 Interferon regulatory factor I (IRF-1) is one of the transcription factors responsible for that activation. 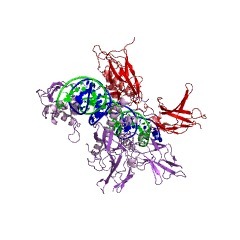 IRF-1 binds to an upstream regulatory cis element, known as the interferon consensus sequence (ICS), which is found in the promoters of type I IFN and IFN-inducible MHC class I genes. 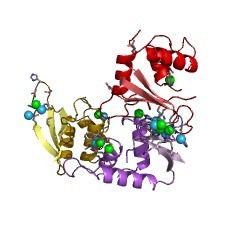 Interferon regulatory factor 2 (IRF-2) is a protein that also interacts with the ICS, but that does not function as an activator; rather, it suppresses the function of IRF-1 under certain circumstances [(PUBMED:2691585)]. 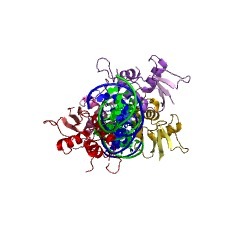 Interferon consensus sequence binding protein (ICSBP) [(PUBMED:2111015)], a transcription factor expressed predominantly in lymphoid tissues and induced by IFN-gamma that also binds to the ICS. 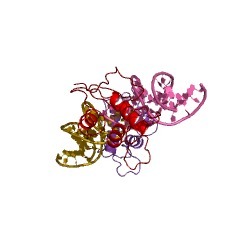 Transcriptional regulator ISGF3 gamma subunit [(PUBMED:1630447)]. 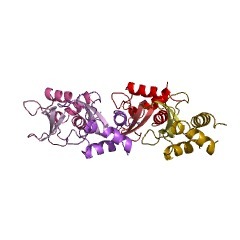 ISGF3 is responsible for the initial stimulation of interferon-alpha-responsive genes. It recognises and binds to the interferon-stimulated response element (ISRE) within the regulatory sequences of target genes. Gamma Herpesviruses vIRF-1, -2 and -3, proteins with homology to the cellular transcription factors of the IRF family [(PUBMED:10933732)]. Neither vIRF-1 nor vIRF-2 bind to DNA with the same specificity as cellular IRFs, indicating that if vIRFs are DNA-binding proteins, their binding has a pattern distinct from that of the cellular IRFs. Whether vIRF-3 can bind DNA with the same specificity as cellular IRFs is not known. 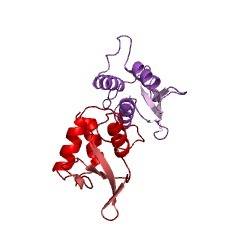 The IRF tryptophan pentad repeat DNA-binding domain has an alpha/beta architecture comprising a cluster of three alpha-helices (alpha1-alpha3) flanked on one side by a mixed four-stranded beta-sheet (beta1-beta4). It forms a helix-turn-helix motif that binds to ISRE consensus sequences found in target promoters. Three of the tryptophan residues contact DNA by recognising a GAAA sequence [(PUBMED:9422515)]. 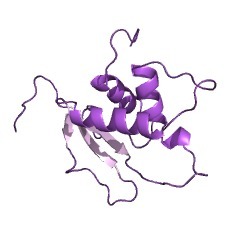 This entry represents the IRF tryptophan pentad repeat DNA-binding domain. There are 3978 IRF domains in 3974 proteins in SMART's nrdb database. Taxonomic distribution of proteins containing IRF domain. This tree includes only several representative species. The complete taxonomic breakdown of all proteins with IRF domain is also avaliable. Click on the protein counts, or double click on taxonomic names to display all proteins containing IRF domain in the selected taxonomic class. 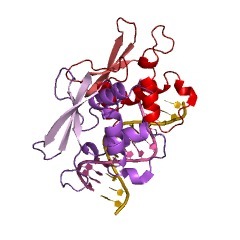 Structure of IRF-1 with bound DNA reveals determinants of interferon regulation. The family of interferon regulatory factor (IRF) transcription factors is important in the regulation of interferons in response to infection by virus and in the regulation of interferon-inducible genes. 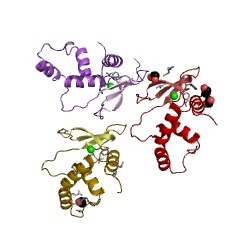 The IRF family is characterized by a unique 'tryptophan cluster' DNA-binding region. 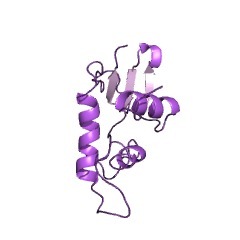 Here we report the crystal structure of the IRF-1 region bound to the natural positive regulatory domain I (PRD I) DNA element from the interferon-beta promoter. 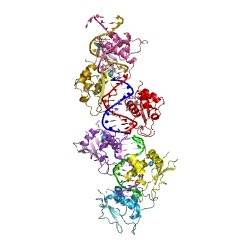 The structure provides the first three-dimensional view of a member of the growing IRF family, revealing a new helix-turn-helix motif that latches onto DNA through three of the five conserved tryptophans. 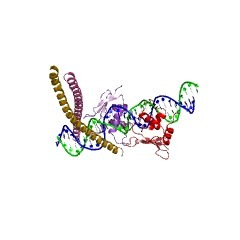 The motif selects a short GAAA core sequence through an obliquely angled recognition helix, with an accompanying bending of the DNA axis in the direction of the protein. Together, these features suggest a basis for the occurrence of GAAA repeats within IRF response elements and provide clues to the assembly of the higher-order interferon-beta enhancesome. Subunit of an alpha-interferon-responsive transcription factor is related to interferon regulatory factor and Myb families of DNA-binding proteins. Regulation of interferon-beta gene: structure and function of cis-elements and trans-acting factors. Commonly viral infections induce expression of type I interferon (IFN) genes. The induction is primarily due to transcriptional activation of the genes. Soon after the isolation of the genes encoding IFN-alpha and IFN-beta, the IFN system became a subject of intensive study in the context of switching on or off the otherwise silent genes by extracellular stimulation signals. Hence, the IFN system serves as a typical model in studying the genetic events occurring in many cytokine systems. The IFN genes contain within their 5'-flanking region positive elements that function efficiently in cells induced by viruses and other stimuli such as double-stranded RNA. At least three transcription factors have been identified and molecularly cloned. Of these, two factors, designated interferon regulatory factors IRF-1 and IRF-2, are unique in their function; they interact with identical DNA sequence elements of IFN and IFN-inducible genes. Results of the functional studies on these factors suggest that transcription of the IFN and IFN-inducible genes is regulated by two similar trans-acting factors that apparently compete for the same cis-acting recognition sequences, but mediate opposite effects. This information is based on mapping of SMART genomic protein database to KEGG orthologous groups. Percentage points are related to the number of proteins with IRF domain which could be assigned to a KEGG orthologous group, and not all proteins containing IRF domain. Please note that proteins can be included in multiple pathways, ie. the numbers above will not always add up to 100%. 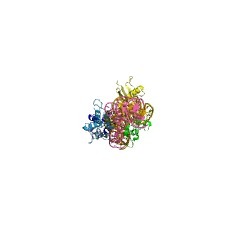 2irf CRYSTAL STRUCTURE OF AN IRF-2/DNA COMPLEX.